Prime Minister Nguyen Xuan Phuc urged the Asia-Pacific Economic Cooperation (APEC) forum to carry forward its role in driving regional and global connectivity while addressing a working session within the 26th APEC Economic Leaders’ Meeting on November 18. APEC should continue to send out the message on its pioneer role in supporting an open, rule-based, transparent and non-discriminatory multilateral trading system, along with further promoting the central role of the World Trade Organization (WTO), he said at the session themed “Connecting for inclusive growth through digital future”. In the context of unprecedented challenges that threaten the stability of the global trade system, each APEC member should display its strong resolve, he said, stressing the acceleration of the liberalization of trade and investment, and respect for international orders based on law as well as the role of global institutions, especially the WTO. The Vietnamese PM suggested stepping up the structural reform in order to narrow gaps among economies and integrating the Renewed APEC Agenda for Structural Reform in the agenda of APEC members, thus ensuring benefits brought about by innovation and technology will reach all citizens and businesses, while supporting disadvantaged groups and small- and medium-sized enterprises. APEC needs to push ahead with the effective implementation of the initiative on cross-border e-commerce, and internet and digital economy, he added. Besides, APEC should invest in digital infrastructure, speed up digital transformation towards comprehensiveness, trustworthiness and safety, focusing on digital trade infrastructure and fin-tech, connect innovative and creative centers, promote startups and upgrade organization and administration skills, he proposed. PM Phuc appealed to developed economies to assist developing ones in structural transformation, administration capacity building and technological application to improve connectivity ability in the digital era. He informed APEC leaders that Vietnam had approved the Comprehensive and Progressive Agreement for Trans-Pacific Partnership (CPTPP) on November 12, noting that it is a specific step forward for the country to participate deeper in the global value chain. The PM also highlighted Vietnam’s efforts in economic reform, growth model transformation and improvement of business environment, personnel quality and social welfare. 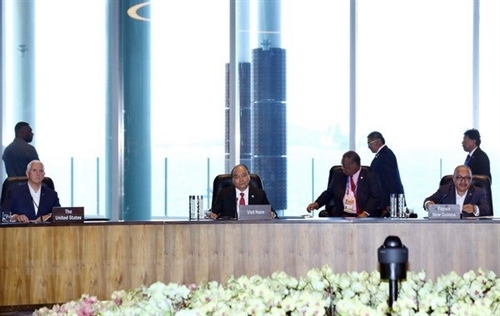 At the session, the APEC leaders reached consensus on the digital economy action program, and agreed to strengthen cooperation in capacity building, skill development and narrowing digital gaps. They emphasized the participation of all social elements in the digital economy, technological application, innovation and creation for sustainable and quality growth. 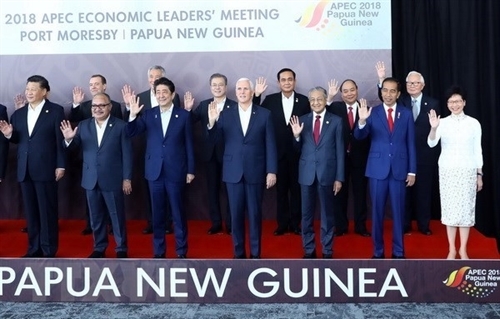 The leaders also committed to accelerating the completion of Bogor Goals by 2020 and the implementation of the APEC Connectivity Blueprint by 2025, gearing towards the Free Trade Area of the Asia-Pacific (FTAAP). Most of them showed their support for the rule-based, transparent, non-discriminatory and open multilateral trading system with the WTO playing the central role. However, there still remained major gaps in viewpoints of some members on issues regarding trade and the multilateral trading system. Also on November 18, PM Phuc delivered a speech at another working session on promoting inclusive growth in the digital economy, in which he underlined the urgent need to spur inclusive growth amidst unstable and uneven growth of the global economy. It is time for APEC to take the lead in boosting inclusive and creative growth in Asia-Pacific, creating momentum for sustainable development globally and the implementation of the UN Sustainable Development Goals (SDGs), he said. The PM suggested APEC take the pioneer role in incubating innovative and creative initiatives, thus turning Asia-Pacific into a global technological center. At the same time, APEC should increase cooperation programs on structural and growth model reform, the improvement of innovative and competitive capacity of economies, the promotion of innovative startups, the building of innovative and creative ecosystem in Asia-Pacific. The PM held that the APEC members need to utilize great opportunities generated by the digital era, put people at the center of development, and support vulnerable groups, especially women, girls and people with disabilities, in accessing digital technology, adapting to changes and coping with risks. He called on APEC to step up gender inclusion, create favorable conditions for female entrepreneurs, increase women’s economic empowerment and set up a network of APEC female entrepreneurs. APEC should contribute more to efforts to counter global challenges, especially food security, he said, stressing the need to materialize APEC action plans on food security and climate change, and rural and urban area development, invest in infrastructure, develop smart agriculture and manage natural resources sustainably. The PM urged APEC to help its developing members apply high technologies in risk control, early warning and post-natural disaster rehabilitation. Vietnam is building a growth-facilitating Government, with attention paid to sustainable and inclusive growth, he said, adding that the country has encouraged startup spirit, innovation and creation, and worked to ensure social welfare, protect the environment and implement the national strategy on the fourth Industrial Revolution.